Complete maxillary nerve block is not commonly required (see Indications below). [1, 2, 3, 4] This is because the wide area of anesthesia resulting from maxillary nerve block (including the dural, temporal, and zygomatic regions; the mucosa of the maxillary sinus; and the maxillary teeth and their soft tissues) is often not needed. Frequently, the area to be blocked is very small (eg, a single tooth), and the appropriate local anesthesia can be achieved by more specific nerve blocks, which also have the advantage of causing less discomfort to the patient. Procedures requiring anesthesia of multiple teeth and surrounding areas: Individual blocks are cumbersome and lead to patient discomfort; multiple blocks may necessitate administering a larger dose of the anesthetic, which may exceed the toxic dose. Large canine abscesses: If specific nerve blocks are given, large volumes of local anesthetic may have to be administered; a maxillary nerve block can be performed with a relatively low dose of the drug. Failure of local blocks as a result of infection or abscess formation: This may necessitate a maxillary nerve block, which is administered far from the site of infection. The maxillary nerve arises in the middle cranial fossa as a purely sensory division of the trigeminal ganglion (see the image below). It gives off a branch as it travels forward on the lateral wall of the cavernous sinus. After leaving the cranium via the foramen rotundum on the greater wing of the sphenoid, the nerve enters the pterygopalatine fossa, which is located posteroinferior to the orbit. Here, it gives off several sensory branches before exiting via the infraorbital fissure and then the infraorbital canal as the infraorbital nerve. The nerve finally emerges from the infraorbital foramen on the maxillary bone along with the infraorbital artery and vein. The intracranial branch of the maxillary nerve is the middle meningeal nerve, which innervates the dura mater. The other branches in the pterygopalatine fossa include the zygomatic nerve, which provides sensory supply to the skin over the forehead and cheek via its zygomaticofacial and zygomaticotemporal branches; and the posterior superior alveolar nerve, which supplies the maxillary molar dentition and the periodontal ligaments, gingivae, and pulp of the molars. The branches of the maxillary nerve in the infraorbital canal include the middle superior alveolar nerve, which innervates the maxillary alveoli, gingivae, and periodontal tissues of the maxillary premolar area, and the anterior superior alveolar nerve, which innervates the maxillary alveoli, gingivae, and periodontal tissues of the central and lateral incisors and the canines. 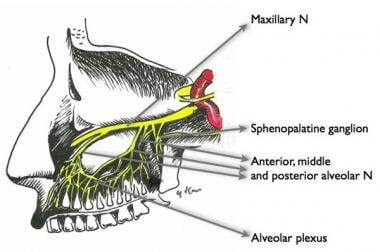 The branches of the maxillary nerve in the face include the inferior palpebral nerve, which supplies the eyelids; the lateral nasal nerve, which supplies the skin on the nose; and the superior labial nerve, which supplies the upper lip and mucosa. Kumar A, Banerjee A. Continuous maxillary and mandibular nerve block for perioperative pain relief: the excision of a complicated pleomorphic adenoma. Anesth Analg. 2005 Nov. 101(5):1531-2. [Medline]. Malamed SF, Trieger N. Intraoral maxillary nerve block: an anatomical and clinical study. Anesth Prog. 1983 Mar-Apr. 30(2):44-8. [Medline]. [Full Text]. Mahoney PM. Maxillary nerve block. Anesth Prog. 1977 Mar-Apr. 24(2):47-9. [Medline]. [Full Text]. Waldman SD. Atlas of Interventional Pain Management. 3rd ed. Philadelphia: Saunders Elsevier; 2009. High tuberosity approach to blocking maxillary nerve. Greater palatine canal approach for maxillary nerve block.